" Sonic - You Can Do Anything "
Sonic - You Can Do Anything is the opening theme in Sonic the Hedgehog CD in the Japanese and European versions of the game. It is also known as Toot Toot Sonic Warrior to many Sonic fans. This song also plays in Green Hills Zone in the 8-bit version of Sonic the Hedgehog 2, in Mecha Green Hill Zone in Sonic Chaos, when invincibility is active in Sonic Drift, is referenced in Sonic Adventure's Invincible ...No Fear!, and remixed for Ocean View in Sonic & All-Stars Racing Transformed. The "Alternate Version" has exactly the same lyrics, but Keiko Utoku seems to be have redubbed her singing as her inflection on certain vocals are different. This song can also be located on the Japanese and European Sonic CD game disc. It is track number 34 on the CD. In recent years, it has been speculated that licensing issues have arisen with the estate of the late Casey Rankin, which has impacted various rereleases of Sonic CD outside of Japan. 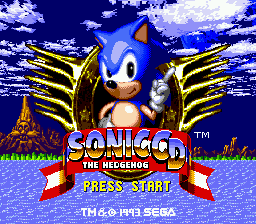 In the Sonic Gems Collection rerelease, the European version was given the US soundtrack despite having the Japanese soundtrack in the original Mega-CD release, and in the 2011 remake, the lyrics in this song and Cosmic Eternity - Believe in Yourself were removed and the songs replaced with instrumentals to the disappointment of fans. These licensing issues may have also resulted in the song's exclusion from Super Smash Bros. Brawl, as evidenced by the leftover filename "snd_bgm_U05_UCANDO" in the game's data. Say "blast off!" - Hey!! What do y'get - Say - Fast jet! This page was last edited on 22 May 2018, at 09:50.